It only takes a second to realize how this hosta got its name. 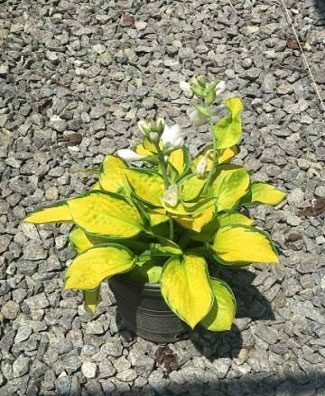 The Rainforest Sunrise hosta is a real standout thanks to its brilliant yellow color. The leaves have golden centers with green edges. But the foliage of this plant isn’t just pretty—it’s also quite hardy. The leaves are thick, corrugated, and cupped, making them resistant to pests like slugs. Pale lavender blooms appear from June to September to add even more color to your flower beds and borders. The Rainforest Sunrise has an average height of about one foot and an average width of about two feet. It’s very tolerant of the sun, meaning it will look great throughout even the hottest parts of the summer. Plant in full shade to partial sun and water regularly for best results.